We no longer carry the 1996-04 Mustang Professional Products 75mm Intake Plenum & Throttle Body Kit 4.6 2V. 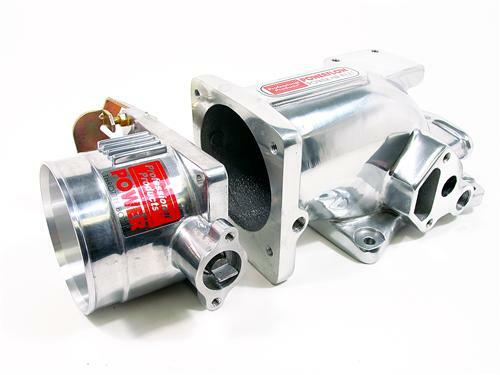 Check out 1996-2004 Mustang Throttle Body for an updated selection. Looking to bolt some extra power on to your 1996-2004 Mustang GT? This throttle body and plenum kit is a great upgrade to any Mustang! This is a throttle body and plenum kit for your 1996-2004 Mustang GT. Both pieces have a polished finish and 75MM openings. This is a great way to bolt on an extra 10-20 horsepower. This kit comes complete with all needed hardware and gaskets for installation.